Offset knotting has sometimes been used to overcome problems posed by an unbalanced knotted-pile weave. 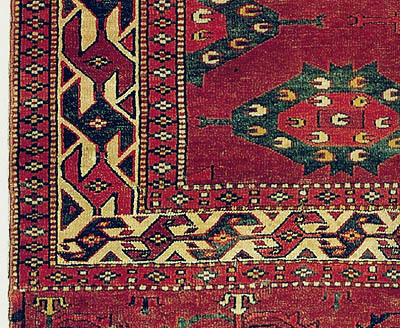 Especially in the middle and late 19th century, standard Turkmen weaves developed with many more knots vertically than horizontally. Designs were thus flattened. The weaver of the early spoon bag (?) at the right (seen here in a fragment) overcame this problem by using offset knotting for nearly the entire field. The pattern was stretched vertically, and offsetting knots helped to smoothly articulate a motif with narrow pattern units. Imagine how this design would look if the edges of the motifs were done with steps, and if the whole design were compressed from top to bottom. There are slight differences in the small parallelogram shapes along the top and bottom of the ivory field. Those along the bottom were done with offset knots; those along the top were done with regular, vertically aligned knots, so they are narrower and more elongated. The wide borders are regular knotting. Keep in mind that the piece is shown here as it was on the loom. It would have been turned 90 degrees when in use. Yomut spoon bag with offset knotting in the field. Oriented as on the loom. Ralph Bradburd. 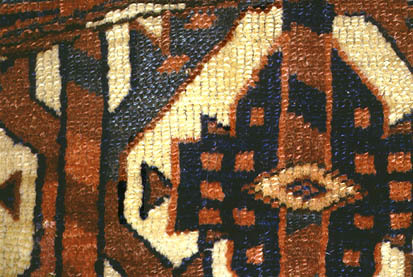 The Yomut okbash detail below also shows offset knotting throughout the entire field -- done largely for the same reasons. Small details in the "butterfly" or "flower" border were also offset, to better articulate the small design. The knotting is shown with great clarity in the HALI 56 magazine plate. 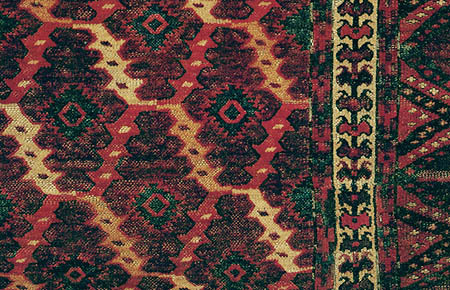 A similar okbash appears in Oriental Rugs from Atlantic Collections, Plate 252. We find offset knotting just in the borders of the chuval below. 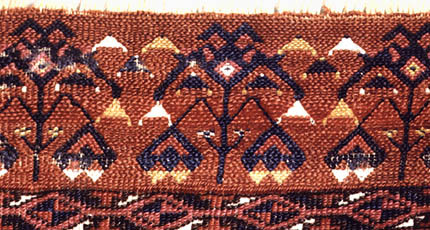 Because this weave has nearly twice as many knots vertically as horizontally, by offsetting the knots, the weaver "squared" the blue and red star motif. The center portion of the top light border with diamond forms is also offset, while bands including angular hooks along the top and bottom of this ivory border are vertically aligned. Knots forming the diamonds in the lower ivory border appear not to be offset, thus these diamonds are flatter. This chuval is a type attributed by Siawosch Azadi to the Igdir, but the basis for this attribution is unclear. Is offset knotting prevalent among pieces supposedly from this group? Igdir (?) chuval and detail of borders with offset knotting. Ralph Bradburd. The narrow "running dog" borders in the Yomut chuval at the right appear commonly in Yomut work -- sometimes articulated with offset knotting, sometimes not. This piece is worn enough that you can clearly see the offset knotting throughout the horizontal border. The vertical border has been drawn differently, and only knots in its triangular sections have been offset; knots in the horizontal/vertical segments were vertically aligned. Below is another Yomut "running dog" border, but one without offset knotting. It is more flattened and elongated. The wide central border, however, is executed primarily with offset knots. There is a strip through the center in which the knots are vertically aligned in the normal manner because only vertical design elements are present. In this photo you can easily compare the degree of slant in the diagonals: Diagonals in the large border are steeper than those in the minor borders. So should the presence of offset knotting have any role in attempts to sub-divide the Yomut? 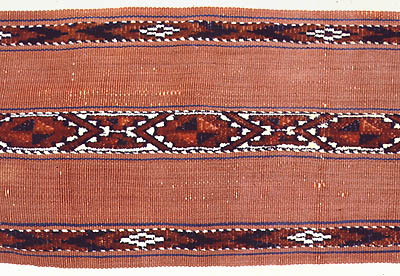 Although this feature appears primarily in symmetrically knotted pieces, it appears occasionally also in asymmetrically knotted Yomut weavings. I have not seen offset knotting in pieces with "Eagle göl" patterning. In the border from a Yomut asmalyk at the right, we can see skinny double hooked devices (yellow or white) produced with offset knotting. These motifs are narrow, they needed smooth diagonal edges, and in the allotted space it was desirable that they stand upright, and not be flattened. The knotted points of the bold orange serrated ashik motifs were also offset, to make crisp contours. These elements contrast with the blocky motifs in their centers, and with the angular hooked borders. We can compare the ashik motifs here with those in the Yomut chuval above (two photos back) which were articulated with no offsets. In a detail from the field of the same asmalyk, below, we also see selective offset knotting. The heavy diagonal lattice elements were made with offset knots; so were portions of the large dark blue medallion. The smooth edges of these details rise at a steep incline, while other elements have less steeply inclined edges. 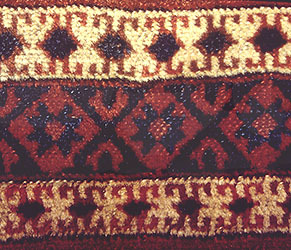 Turkmen storage bags made with alternating flat-weave and knotted-pile bands often feature motifs with offset knotting. The knot count in pile areas of the piece below is high (360 per square inch), and the difference between horizontal and vertical knot counts is great: there are 10 knots horizontally, 36 knots vertically. Designs knotted in the normal manner with such a weave balance are quite compressed, as you can see in the two narrow bands. 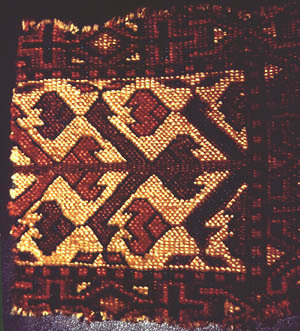 In the larger band on this bag, diagonal elements were articulated with offset knotting. 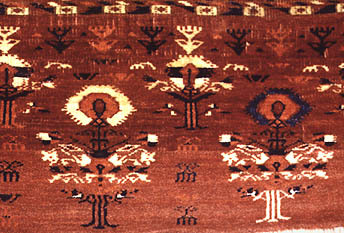 The so-called "bird and pole" border on the Yomut carpet shown in detail below has also been executed with offset knotting. Presumably this was done to correct problems created by an unbalanced weave -- twice the number of knots vertically as horizontally. 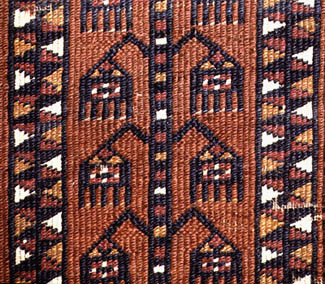 Caucasian and Persian weavers who used this motif did not confront the same problem. Yomut main carpet border. Tzareva, Rugs and Carpets from Central Asia: The Russian Collections, Leningrad, 1984, Plate 66. Offset knotting throughout this border can be seen clearly in the book plate with a little magnification. Let's back up a bit, and consider a technical matter. Where offset areas and vertical design elements meet, there are extra warps in alternate rows that must be dealt with in some way. Occasionally, weavers have left these warps unknotted (right). At other times, they have tied symmetrical knots on three warps (below, left). On the back these are larger and lop-sided. More commonly, two knots are crowded onto three warps, overlapping to share a single warp (below, right). Occasionally single-warp knots appear. These drawings are from Woven Structures: A Guide to Oriental Rug and Textile Analysis. When a weaver switches from vertically aligned knotting to offset knotting, one of these transitions must be used in every second row if the design has vertical edges. To avoid uneven areas of pile thickness that would occur if overlapping knots were tied on the same warps, row after row, some weavers have scattered their transitions erratically. Conversely, when transitions are made with knots on three warps, more sparse pile areas are produced, and so a wise weaver staggers those also. In the detail below, from a Saryk ensi border, knots forming the stems and tops of the drooping flowers are all offset. Most of the transitions were made next to the diagonal stems, so that knotting in the field is nearly all vertically aligned. Only in the small triangular field sections under the bent stems does the offsetting continue through the background. In this photo we can compare the slant in the flower tops and stems with the diagonals in the small border triangles. The triangles done with vertically aligned knotting are flatter. The two rows of drooping flower motifs in the Saryk elem below show different approaches. The lower border has no offsets, while the upper border has extensive offset knotting in the diagonal flower forms. There are many variations on the drooping flower motif in Saryk ensis and chuvals. The example below, however, seems to be one of the earliest. It is certainly one of the "purest," since the designer managed to articulate virtually all of the design parts with diagonals. Thus the offsets in most areas could be continued straight across the piece. The only need for transitions occurred at the vertical flower stems and at the small "drops" placed at the lower corners of the intermittent triangles. These small details may not have been part of the original design. This example has much more consistency than later examples in which more and more vertical elements appeared that interrupted the flow of knotting. 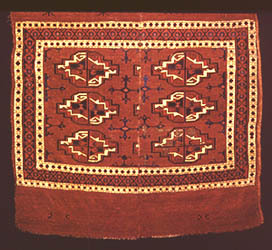 The photo below shows one of the earliest Turkmen motifs done in offset knotting: a two-part flower or cup-like motif from a Tekke torba with "ak su" field patterning. 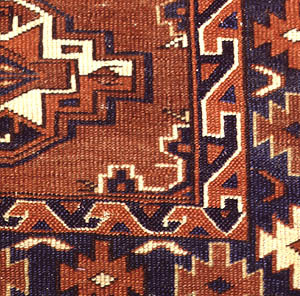 As long as the pair of motifs was repeated horizontally across the weaving, no transitions were needed; since most parts of the motif were formed with diagonals, the offsetting was continuous. In the top two or three rows of knotting all pattern elements are vertical, and so the knotting could be continuous in those rows also. The same is true at the short flower stem sections--one near the middle, another near the bottom. 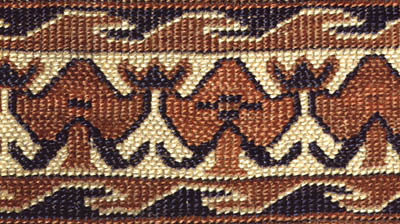 When this design was used for vertical borders its simplicity disappeared, because transitional knots were needed to accommodate vertical border edges. 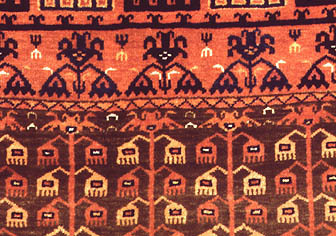 When this double "cup" figure was used for a field design on a small mafrash or khalyk, with several borders stacked one above the other, offset sections alternated with regularly knotted bands. 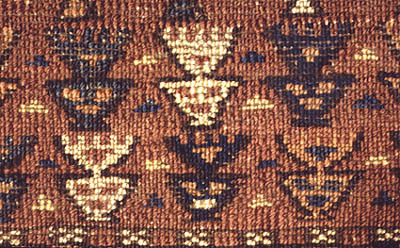 In the mafrash below, the weaver has attempted to curve parts of the cups by a combination of one-warp and two-warp steps. Thus overlapping transitional knots were needed in many, many places. 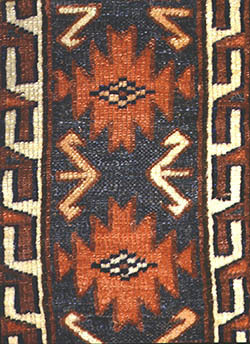 Some of these weavings seem so different from mainstream Tekke work, it makes one wonder about their usual attribution. In the Tekke chuval below we again see the "cup" border in its purest form. But here it appears above an elaborate floral skirt motif that is also articulated with offset knotting in a few places. Several variations on this flower motif exist, but all feature offset knotting used in at least a minor and localized fashion. No matter how much they are magnified, these details are difficult to see in photos; they are easy to locate, however, when one has the pieces in hand. In this chuval the weaver has used three methods of making transitions between offset and vertically aligned knotting: skipped warps, knots on three warps, and overlapped knots. 7.A - Offset Knotting: Where and Why?